I wrote this story for all the young girls out there who have been taken advantage of by an older man in a trusted position of authority, either sexually or emotionally or both. 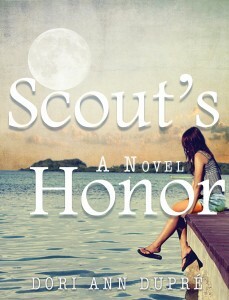 I wrote it for those who still need to reclaim their honor, to encourage them that their honor is already within them. Oftentimes, because their situation was “consensual,” these girls do not know what really happened to them until much later in life. At the time, they were simply too young to process the entire manipulation and eventual trauma correctly. This kind of damage changes a girl for the rest of her life in ways that cannot be necessarily quantified. So many girls never deal with the emotional suffering related to having their innocence taken because of the shame associated with it; therefore, these stories go untold. They live with it and it affects their later relationships, their judgment and decision making and how they deal with other difficulties in their lives. Scout Webb’s story is just one kind of journey that an untreated traumatized girl takes toward eventual healing. First, I wanted an all American southern girl and boy. So I created Scout and Charlie. Scout is supposed to be every girl, every woman. Charlie is supposed to be the epitome of a man, in my opinion. He is a true friend in every way. I wanted Doug to be an average husband and father who is struggling in his life and marriage with the typical challenges, who is otherwise likeable, but finds himself going down a dark road where there is really no return. This sometimes happens to otherwise good people who are not dealing properly with their own internal issues. I wanted him to have a regular exhausted wife of a toddler in Cammy. I created Rob to be like so many good and decent men who always do the right thing – until they don’t, lose their way for a short time for one reason or another, and then have to spend the rest of their lives trying to get back to being the man they once were. Oftentimes, a man who strays in his marriage is defined by that one wrong thing rather than the millions of wonderful things he has otherwise done in his life. I created Rita to be a very well grounded and emotionally secure woman who is able to separate her emotions from rational thought, who loves and is strong enough to forgive as well – to see past the bad act and instead a human with flaws, worthy of forgiveness. I created Jemma to be the kind of girl that Scout was supposed to have been had she not suffered at the hands of Doug as a fourteen year old. Thom Robinson was created to represent that kind of man who everyone loves on the surface until he reveals what he truly is. And he only does this after he has sunk his hooks into his emotionally damaged prey – otherwise know as the narcissist. It was easy to come with him because they litter the airwaves and movies and magazines and political scene: powerful, manipulative and larger than life personalities, putting on a big show. One part of writing this book that was a lot of fun for me was being sure to include all of my relatives’ names in the story somewhere. For example, my brother’s name is Jon, so I made Scout’s brother’s name be Jonny. Micaela is Scout’s college roommate. That is my niece’s name. There’s a Chase and a Samantha, also my niece and nephew. My family’s names are littered throughout the story as camp counselors and side people. Lee (Leigh) and Raelene are my girls’ middle names. Several minutes later, when I listened to Charlie’s very deliberate voice tell me about what was going on with Ms. Porter, I finished Venus’ exam as fast as I could and told Paw that I had a family emergency and needed to get to Harper Hospital down in Fayetteville as soon as possible. When I got there almost an hour later, my parents were both with Charlie and I had never in my life seen him in such a state. His face was ghostly white, like life itself had disappeared from his body, and when he saw me, he grabbed onto me like he was a little boy again. Sandy-haired little Charlie with the big toy dump truck that we’d push around in the sun yellow kiddie pool. Eventually, I got him to sit with me on one of the hard plastic chairs in the waiting room and my daddy told me that he and my mom were going to head up to Raleigh to let Boo out and go to Jemma’s game. They would get her some supper and take her home afterward and would even stay the night if I needed them to, so I could tend to Charlie. In my emotionally frazzled head, from both the bizarre drama the night before with Thom and his daughter and now this horrible tragedy with Charlie’s mom, I hadn’t even thought about the fact that Jem had a game today and that my parents were planning to come up for it. “Yes, of course,” I said, my hands tight on Charlie’s shoulders as he sat in the chair, frozen, paralyzed, by the horrible shock of his loss. Charlie has dealt with a ceaseless amount of crime scenes and victims over the past several years — all kinds of deaths, murders, rapes, shootings, suicides, stabbings, and some of the ugliest things that human beings do to each other or do to themselves. His mother died of natural causes on an average sunny spring day while working at the hardware store and, instead of the thoughtful and stoic SBI agent, he just turned into that sad little boy again, the one with no father, the one who had come up to me at the church Easter egg hunt when we were five years old and asked me if he could have one of my eggs. I remembered it like it was yesterday. I found ten plastic eggs during the hunt and each one was supposed to have jellybeans in it. A towheaded boy in desperate need of a haircut with a red and white striped shirt, blue shorts, and bare feet, walked up to me as I sat by myself under an azalea bush near the steps of the church’s entrance. My mom had given me a plastic pastel-colored basket she bought for a nickel from a yard sale and I used it for this egg hunt, my very first one. Eyeballing this scrawny boy who I had never seen before, and who had ketchup smeared on the sides of his mouth, I asked him who he was. “Where’s your mom and dad?” I asked him, with the authority of an adult. He turned and pointed at a young blond woman in a peach colored sundress, sitting at one of the picnic tables by herself. I considered that for a second, realizing that I had never heard of someone not having a dad before. So I handed this Charlie Porter boy one of my eggs. It was purple. He opened it and out dropped three jellybeans and a slip of paper. “That’s the special egg,” I said to him, excited that I was the one who found it. “What’s a special egg?” he asked me. He was right. I did find it. But there was something interesting about this strange little boy who was shorter than me and who made me feel like we had been friends before, once upon a time and in a land far, far away. Not long ago, when I was in a drug store, I read something on a greeting card that said, “Souls recognize each other by vibes, not by appearances.” That was the best description I ever came across about what transpired between me and Charlie Porter on that warm spring day so long ago. Taking the piece of paper from him, I grabbed his hand and put it between our hands and held them together. I picked up my basket and walked with him hand-in-hand, leading him over to Pastor Rhodes who was standing next to the grill with the sizzling hotdogs. “Pastor?” I said, getting his attention. Pastor Rhodes looked down at me. “Yes, Miss Scout,” he said smiling, holding a pair of tongs in his hand. “Charlie and I have found the special egg,” I said, unclasping our hands and giving him the piece of paper. Three minutes later, we were sitting under a large dogwood tree, sharing the biggest chocolate bunny I’ve ever seen. And now, twenty-nine years later, almost to the day that we shared that chocolate bunny and became the best of friends, I held him in Harper Hospital as he wept the kind of weeping that has no tears or noise, the kind of weeping that a grown man does when he loses his mom forever.